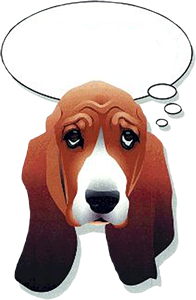 For BROOD, fundraising is our lifeline -- it allows us to save as many bassets as we do. In 2017 we rescued and took care of 116 dogs and adopted out 91. As of December 31, 2017 we have rescued 3019 basset hounds since BROOD was founded 21 years ago! So whether you want to make a cash donation, make a purchase through one of our affiliates or make a bequest, we ask that you please support one or more of BROOD's current fundraising activities. Make a Donation If you want to make a cash donation, you can always contribute to BROOD. You can pay with Check, Credit Card or PayPal. And because we're recognized by the IRS as a 501(c)(3) organization, your gift is tax deductible! Monthly Giving Making a monthly donation through PayPal is an efficient and easy way to support BROOD on a regular basis. You won't have to mail a check and it's easy to budget, too. It's simple to set up and you choose the monthly amount to donate, plus it can be started and stopped at any time. Go to our Donations page to set this up today! Matching Employer Gifts Many companies offer a matching gift program to encourage philanthropy among their employees, and some companies will even match donations from spouses and retirees. Click here for more information about matching gifts. Planned Giving You can make a difference in the lives of homeless hounds by including BROOD in your estate plan. Planned gifts can be as simple as a bequest in your will or naming BROOD as a beneficiary of your retirement accounts, insurance policies or other financial accounts. FirstGiving Creating your own FirstGiving page is an easy way to raise money online. Learn more by clicking here. Virtual Fostering Kennel fees are a huge part of our annual expenses. If you can't foster, consider sponsoring a dog's kennel fees of $10 a day. It's a tax deductible contribution too! In Honor Of and Wedding Gifts A donation in honor of a friend or family member will support BROOD's rescue work and is a wonderful way to celebrate the special people, animals and events in your life. To learn more, click here. Faces of BROOD Success Story If you have adopted a basset from BROOD, you can have your dog featured on the BROOD website! For a tax deductible donation of only $10, your BROOD dog's photo will be featured as one of the success stories for one year. Please see our Faces of BROOD page for complete details and an entry form. Sell on eBay You can raise money for BROOD and clean out some of the unused items in your garage, attic or closet. Check out our Sell on eBay page for details on how the program works. Shop and Support BROOD Check out the many ways we have for your shopping to support BROOD. From the BROOD Store, to our Zazzle store and our many affiliates, your shopping online helps us! Go to our BROOD shopping page to see all the options.